The Muchalinda Lake is located to the right of the Mahabodhi Temple. Legend has it that Lord Buddha achieved enlightenment after a seven-week-long mediation at this very lake. 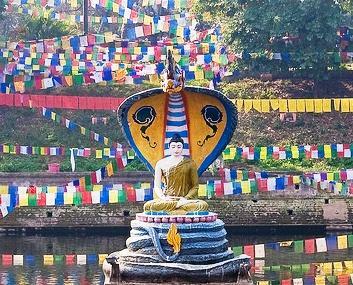 A statue of the Buddha meditating on a snake coil and protected by the hood of Muchalinda, the Snake King is placed at the center of the lake. Also known as the “Lotus Pond”, it is surrounded by lush greenery and has a very calm atmosphere around it. How popular is Muchalinda Lake? People normally club together Cankamana and Chinese Temple while planning their visit to Muchalinda Lake.